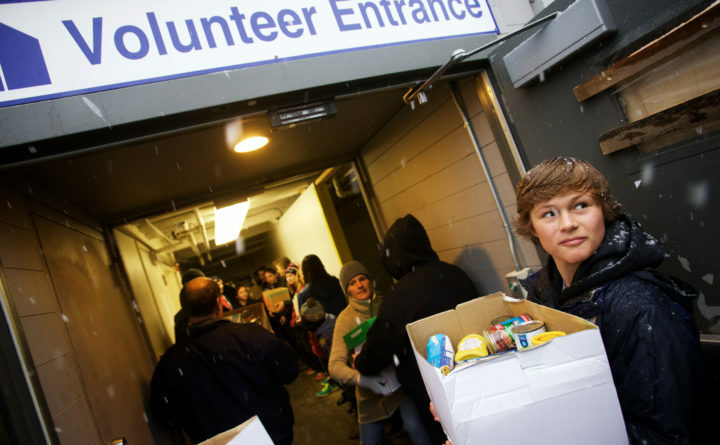 Volunteers unload food at the Portland nonprofit Preble Street in the snow, Nov. 26, 2014. Nonprofit organizations in Maine continue to attract a strong workforce, but wages aren't keeping up with inflation, according to the 2018 study by the Maine Association of Nonprofits. Nonprofit organizations, which employ one in six Maine workers, expect staff levels to rise or stay the same during the next 12 months, even though wages aren’t keeping up with inflation, a new study finds. Maine’s 501(c)3 charitable organizations employ more than 95,000 people, representing 16 percent of all jobs in Maine, according to the Maine Association of Nonprofits, which released its 2018 study late last week. The study is available for a fee, but a snapshot of results is free. The study found that nonprofit employment is strong and growing, with 93 percent of organizations that responded saying they will increase staff levels or keep them the same during the next 12 months. Some 39 percent will increase staffing. The report surveyed 310 nonprofits, or about 10 percent of the 3,000 nonprofits in Maine. The report includes wages for 6,812 full-time and 294 part-time Maine employees. But 85 percent of full-time positions in the study reported wage increases that did not keep up with inflation. The benchmark hourly wage rose only 66 cents, or 2.8 percent, during the past two years, lagging inflation of 6.2 percent adjusted for prices over the two years, the association said. Maine’s benchmark hourly wage across 27 jobs at nonprofits is $24.24 compared to $25.67 in neighboring New Hampshire and $24.44 in Vermont. Rising insurance costs are pinching both employers and employees. Some 77 percent of the nonprofits that offer health insurance said their benefits costs rose during the latest renewal period, hiking employee contributions, copayments and deductibles. “Just like our private-sector colleagues, nonprofits are increasingly under pressure to offer competitive pay and benefits to attract and retain talent while continuing to provide the services people rely on,” Jennifer Hutchins, executive director of the association, said in a prepared statement. In a 2017 report, the association said nonprofits make a significant economic impact on Maine. They contribute about $11 billion annually to Maine’s economy through wages, retail and wholesale purchases, and contracted professional services. The $4.3 billion paid in annual wages translates into about $264 million in personal income tax revenue.